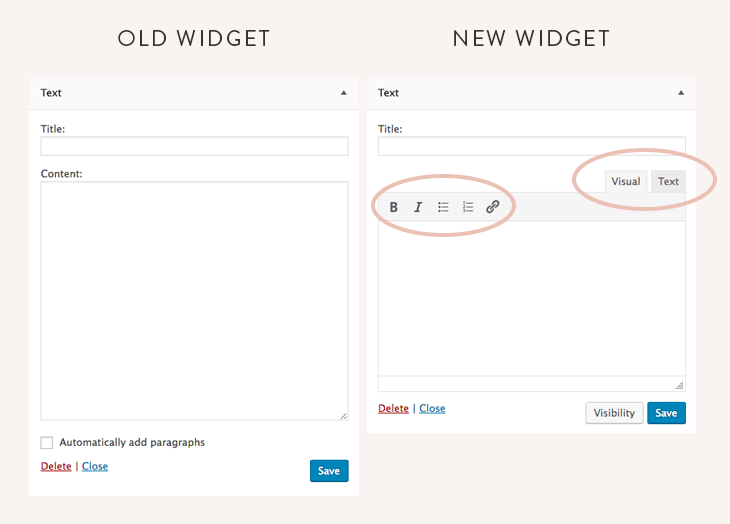 The Wordpress 4.8 update in June 2017 introduced big changes to the Text widget. The Text widget used to be suitable for HTML (i.e. the code for the social icons) and it's what we formerly advised you use to place any HTML on your site. Now, the new changes to the Text widget has made the Text widget an unsuitable option for HTML. Why can't I use HTML in the Text widget anymore? The update made to the Text widget changed the way contents of the widget are outputted. When you place HTML in a Text widget, the HTML is not interpreted correctly. This can cause some strange effects on your site, such as your social icons displaying vertically, your sidebar photo not working, etc. In August 2017, Wordpress introduced a new "Custom HTML" widget. This new widget allows you to place HTML in any widget area on your site. If any HTML is displaying incorrectly on your site, you can solve the issue by switching to a Custom HTML widget instead of a Text widget. Note: Do not copy your social icons code from a Text widget and paste it into a Custom HTML widget. The full code won't transfer over. You'll need to grab a FRESH copy of the social icons code and paste it in a Custom HTML widget. Visit the bottom of this page for a fresh copy of the code.